Well, I enjoyed this so much more than I thought I would. Horror’s not normally my thing, but this story sucked me in so much. It was another story finished in two days and I pretty much immediately picked up the sequel. That’s how good this was. I have to admit, I first picked up this story because of the Supernatural vibe. And of course, the high praise. But also, the Supernatural vibe. And while the story did have a lot of things reminding me of that (ghost hunting Dean Winchester-like teen, family business, moving around, dead dad), it also had so many original aspects that made the story stand on its’ own nicely. Cas was a great main character. I really loved his voice – he sounded real and believable to me, both as a teenage boy and as a badass ghost hunter. I loved how he was a little jaded in the beginning – moving around, killing ghosts, never getting attached to anyone. And then he goes after Anna Dressed In Blood and suddenly his life turns upside down. Here’s this ghost that he just can’t seem to kill and then there are these people getting involved and actually becoming his friends. It’s definitely not what he’s used to, but it sure makes for a great story. Talking about his friends, the group dynamic was one of the best parts of this book for me. I love these rag-tag kind of groups, coming together and making a connection. If it would have been just Cas, I may not have liked this as much, no matter how much I liked him. It’s the friend dynamic that sold it to me. There’s also a family dynamic, which is surprising considering it’s about a teen hunter. But Cas’s mother plays a big part in his life, both as his mother and as a witch. She’s worried and protective about her son, but still also super understanding and supportive and it was intriguing watching their interactions. But of course, there’s also the infamous title character. Anna is another highlight of this book. Just like Cas, I was immediately fascinated with her story. She’s a walking contradiction: both the black-veined, blood-dripping goddess of death who can tear a man in two with her bare hands and the sweet, innocent girl in a white dress. She is both and that’s what makes her so interesting. How did she get this way? What happened to her? As for the horror in this story, I think it was still ok. It was gory and gruesome in some parts, completely creepy in others, but it was balanced out with a little bit of humor, a little bit of friendship and even just a smidge of romance. I’m a big wuss and I could handle it, so I think this is indeed a great introduction to the horror genre. I may try some more, who knows? Overall, I really enjoyed this book. If you like ghost stories and are looking for a creepy read, but just don’t know where to start, this is definitely a good choice! “But somewhere out there is the one that matters. Somewhere out there is the one that I came for, one who is strong enough to squeeze the breath out of living throats. 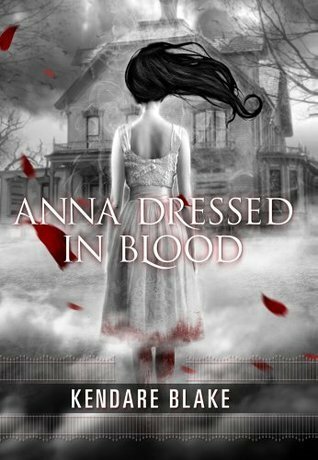 Have you read Anna Dressed In Blood? What did you think about it? Thanks for visiting Finding Wonderland, Lindsey. I know, it doesn’t happen very often 🙂 I mean, she still lets her son go out and put himself in danger, but at least it’s discussed that she is constantly worried and she is somewhat involved in his life.